Our process covers cash flow to retirement and can answer questions like, “Have I saved enough? Do I have enough life insurance? How do I navigate social security?” and beyond. Understanding your concerns and your big picture allows us to work together to make the best financial decisions for today, tomorrow, and the future—including unexpected events. Having an open and honest discussion before building your plan allows us to gain insight and best prepare you for whatever may happen and wherever you may want to go. Nearly 2/3 of our team are CFP® Practitioners, meaning we have one of the highest numbers of CFP® Practitioners of any independent firm in Austin. As such, we can provide the highest level of service for your wealth planning needs. During our initial meeting with you, we will establish short and long-term financial objectives. 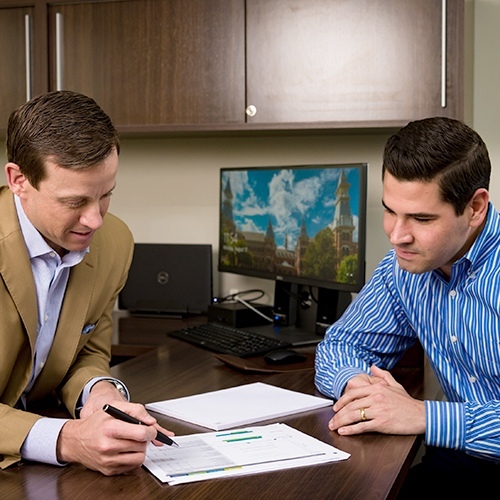 We conduct a detailed review of investment statements, tax returns, sources of income and expenses, insurance policies, legal and business documents, and employee benefits to help guide our discussion and narrow the focus. To put your plan in motion we prioritize recommendations, develop a timeline, and coordinate resources (including third-party partners when necessary). Tracking and managing your portfolio is a continuous process and conversation. We are on an unlimited access retainer so you can reach out to Austin Asset team members at any time. Our proprietary tools set goals and track financial performance tailored to you, created by our team. The Building Organized Wealth (BOW©) is a dynamic tool used to model different incomes, expenses, and savings scenarios. The BOW aligns your goals with your actual financial situation for that year and designs an appropriate portfolio to achieve your financial goals. The Actual Rate of Return on Wealth (ARROW©) Report provides an outlook of your portfolio’s actual performance against the yearly goal set in the BOW© model. The ARROW© tracks your entire portfolio, including assets managed and not managed by Austin Asset. As our valued client, you’ll have access to our Online Performance Reporting Portal. This platform is a secure, user-friendly way for us to share sensitive documents and for you to both download quarterly reports and view comprehensive reporting on your portfolio. Every 90 days, you will receive a report on your portfolio’s progress though we invite you to visit us quarterly if you prefer to review your progress with your team. At the minimum, we’d like to meet in person for an annual review to discuss your past year’s portfolio performance, and projections for the coming year’s income, expenses, and savings. Any changes, new goals, or objectives will be factored into your updated and revised BOW©.